They say books are better than movies, and I’d agree. But I’ll be the first to admit: when reading the Hunger Games trilogy, I never would have dreampt up this knit vest deign Katniss wears in Catching Fire. 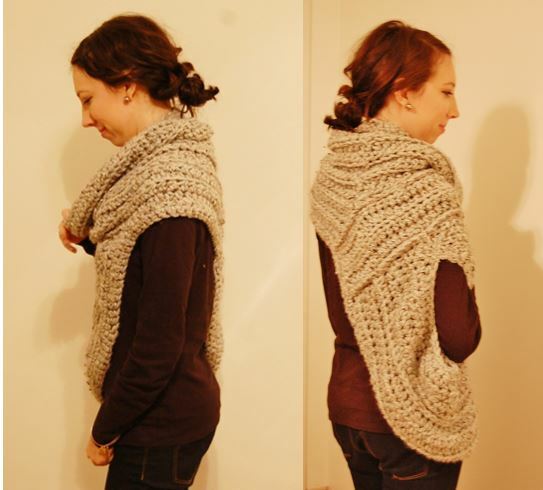 My friend thought his wife would like this chunky version of the cowl by TwoOfWands. 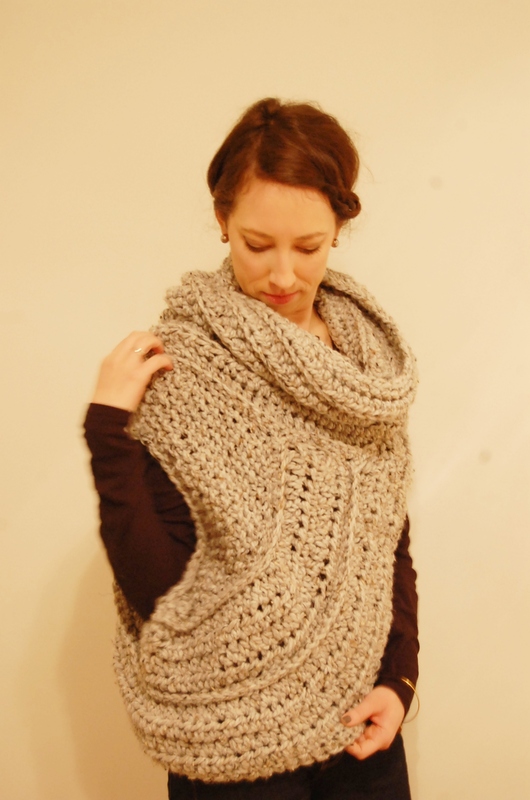 It was made in my favorite yarn (Lionbrand Wool-Ease Thick & Quick) so I was looking forward to the project. I mean let’s be real, who wouldn’t want to look like Katniss? Channeling Katniss with a side-braid… Not my best look. Open on the left side; arm hole on the right. Knit panel over the right shoulder; the rest of the cowl is crocheted. This pattern is clearly written and was a fun project amidst the many Christmas projects I had going on. 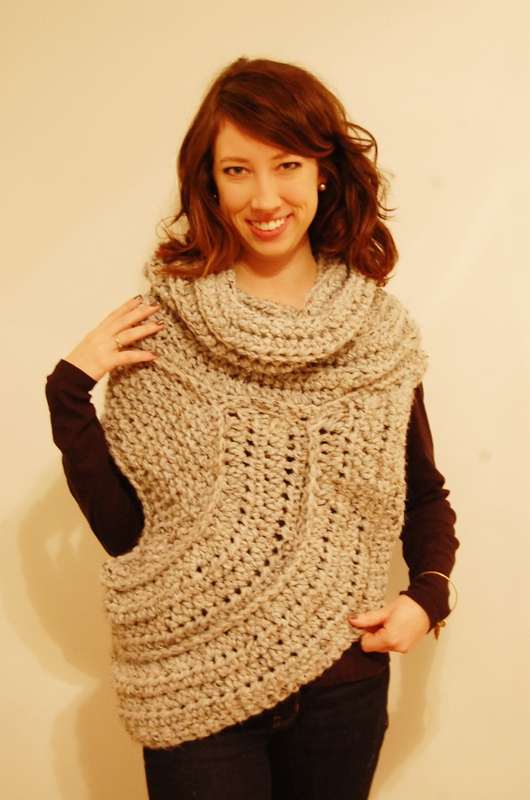 It’s 4 parts crochet and 1 part knit; the chunky yarn helps it work up quickly. It’s made in 5 separate pieces which makes the construction a little tricky and since it’s not a normal sweater or vest, I needed a couple tries to piece it together. Does it swoop left then right or right then left? Odd elements: Working two separate panels for the main “swoop” piece when I thought one would have worked. Also using single crochet to seam the pieces together rather than stitching them with a darning needle. It makes the seams visible which is a ‘look’, but I’m not sure it would have been my first choice. During the brief time I had the cowl/vest on to take pictures, I realized just how warm it was. I’m sure my friend’s wife will like it. Down with the Capital… Katniss and Peeta forever. I’m 5’6″, yet the cowl was made for someone closer to 6 feet tall which is why it’s a tad big on me. I did size up a hook when making the main body of the cowl since I wanted it to be larger. My version definitely covers more of my body than the original pattern shows (and definitely more than Katniss’), but I like how it turned out. 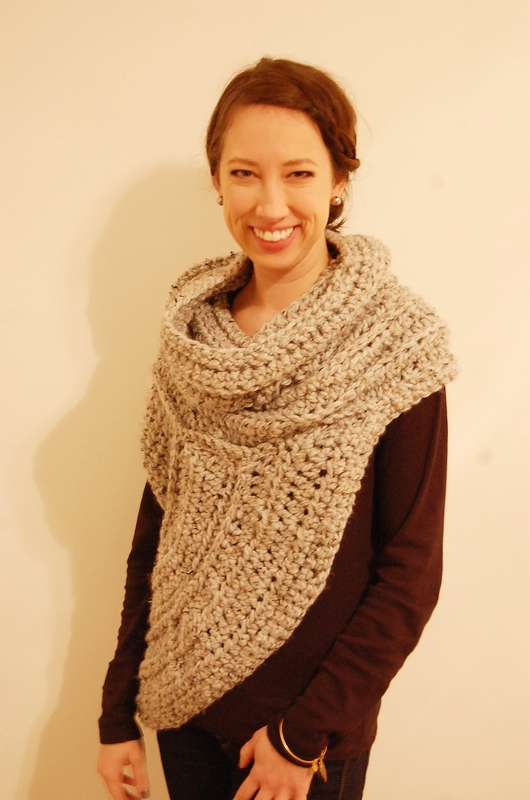 I’d love to see a picture of your finished cowl! If you do decide to write up your own, let me know, I’d purchase it to try for sure.